February is upon us and we have had a successful start for 2017 and albertapatients.ca. As we head into the midpoint of the winter months, we are exploring – and being approached about -- partnerships to bring more value to albertapatients members. You have provided us with a wealth of information about what you think matters in the system. We have shared this with people who lead the system, including Alberta Health Services, Alberta Health, the Health Quality Council of Alberta and others. We also like to provide you with information and resources to help increase your understanding of the health care system and perhaps smooth the way through it. Very soon, we’ll be bringing you answers to many of the questions about seniors’ care, support, navigation and other issues. These were questions that you wanted us to investigate when we surveyed you about what you want to know about seniors’ care. 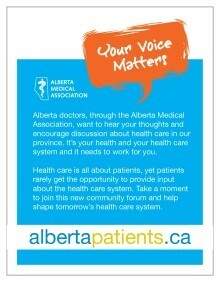 Watch for this information in the next albertapatients newsletter. We will also be in touch again soon to direct you to a new and really interesting resource for Albertans (and you may have heard about this already in the news this week). The Health Quality Council of Alberta (HQCA) just launched a terrific new website, designed to give Albertans a new way to look at emergency departments and the way they compare to each other in a number of quality-focused dimensions. We encourage you to go have a look: http://focus.hqca.ca/ (opens in a new browser window). If you have feedback about the FOCUS on Emergency Departments website you’d like to share that we can pass on to the Health Quality Council, we would be glad to do that. Simply email your comments to support@albertapatients.ca (please note: any feedback we receive will be shared anonymously). While you’re thinking about emergency departments, you might recall that we recently surveyed you about your experiences when visiting them. We shared the very interesting results with you in the November 2016 newsletter and we are providing a link to that info again with today’s issue just to refresh your memory. Click to view our report (opens in a new browser window). Thank you, as always, for your continued participation. We appreciate the value you bring!